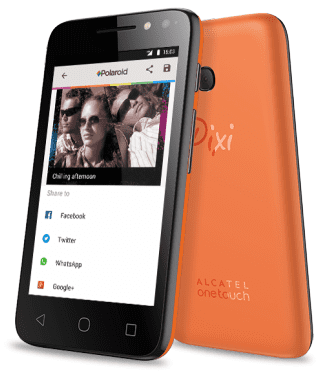 Alcatel Pixi 4 (3.5) is the smallest and cheapest offering in the latest Pixi line-up of affordable devices, which also features the Pixi 4 (4) and Pixi 4 (6). The entry-level device offers a tiny HVGA display, a dual-core processor and Android Lollipop OS. Just like the other new Pixi 4 smartphones, the Alcatel Pixi 4 (3.5) exhibits a unibody design which help to boost its aesthetic appeal. The build quality is solid, although the body is made of plastic. It is, however, a pretty thick device at about 10 millimetres. The phone uses a 3.5-inch diagonal display with an HVGA resolution of 480 x 320 pixels. This is a very basic display and only manageable clarity should be expected with a pixel density of about 165 ppi. The Pixi 4 (3.5) packs a combo of a 2-megapixel rear-facing camera with LED flash and a 0.3-megapixel front-facing camera. The offerings in the camera department go further to confirm this phone is for entry-level users. For storing your photos, videos and other files, Alcatel OneTouch gives users 4GB internal storage on this smartphone. That storage space surely will not suffice for many users, so up to 32GB card is supported for storage expansion. On the inside, the Alcatel OneTouch Pixi 4 (3.5) is equipped with a dual-core MediaTek MT6572M processor moving along at peak speed of 1 GHz. The Cortex-A7 CPU is paired with a Mali-400 MP1 graphics solution and 512 MB of RAM. It is safe to say robust multitasking will suffer on this one. The Alcatel Pixi 4 (3.5) is the only phone in the new Pixi line-up that is equipped with an older Android 5.1 Lollipop operating system, which is still impressive for an entry-level device. You get a 1,300mAh juicer on the Alcatel Pixi 4 (3.5), with this rated to deliver talk time of 4 hours and standby time of about 10 days. It supports high speed HSDPA+ connectivity for enjoyable mobile browsing experience. Connectivity features also include microUSB 2.0, Bluetooth 4.0 and Wi-Fi 802.11 b/g/n. Alcatel Pixi 4 (3.5) is not yet available in Nigeria. When available, you can buy it at leading online stores in the country. Alcatel Pixi 4 (3.5) Price in Nigeria is expected to range from N15,000 to N25,000 depending on your location in Nigeria.